In 1516-1517, Raphael painted a picture of St Cecilia, the patron saint of musicians and Church music, listening to a choir of angels. Clothed in gold, as described in the 13th century text Legenda Aurea (Golden Legend), St Cecilia is surrounded by four Biblical figures. On her left stands St. Paul. Holding a letter in his hand, he looks downward, absorbed in deep contemplation. Next to him is St. John the Evangelist, easily recognizable by the eagle* at his feet, which represents the Gospel. He's looking at St. Augustine, who is gazing back at him. The other woman near St. Cecilia is Mary Magdalene, carrying an ointment jar, with which she anointed Jesus' head and feet. 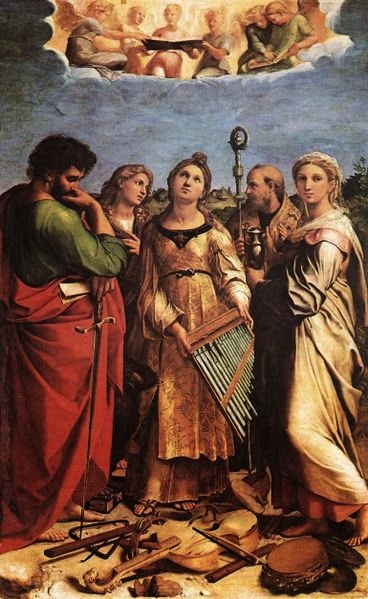 The central figure, St. Cecilia, seems rapt in such inspiration as produced her image in the painter's mind; her deep, dark, eloquent eyes lifted up; her chestnut hair flung back from her forehead — she holds an organ in her hands — her countenance, as it were, calmed by the depth of its passion and rapture, and penetrated throughout with the warm and radiant light of life. She is listening to the music of heaven, and, as I imagine, has just ceased to sing, for the four figures that surround her evidently point, by their attitudes, towards her; particularly St. John, who, with a tender yet impassioned gesture, bends his countenance towards her, languid with the depth of emotion. At her feet lie various instruments of music, broken and unstrung. The altarpiece was commissioned in 1514 by Elena Duglioli dall'Oglio, a rich and mystic lady from Bologna, for her family chapel in the church of San Giovanni in Monte. It is easy to see why Elena chose this subject. St Cecilia had remained a virgin even after her marriage, even converting her husband to a life of celibacy. Elena, when she got married, followed the saint's example. The painting was brought to Paris in 1793, where it was transferred to canvas. In 1815, it returned to Italy, and can now be seen in the National Painting Gallery. Unfortunately it is in poor condition, having been damaged by repainting over the years. * St. John is often represented, in paintings, with an eagle, which symbolizes the heights to which he rises in the first chapter of his Gospel.